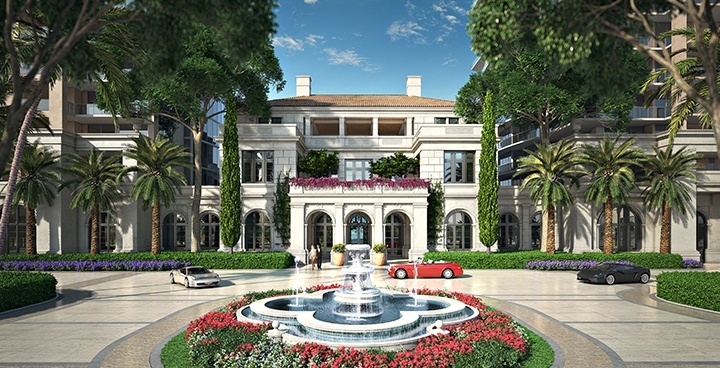 Coming soon on the ocean in Sunny Isles Beach - The Estates at Acqualina. 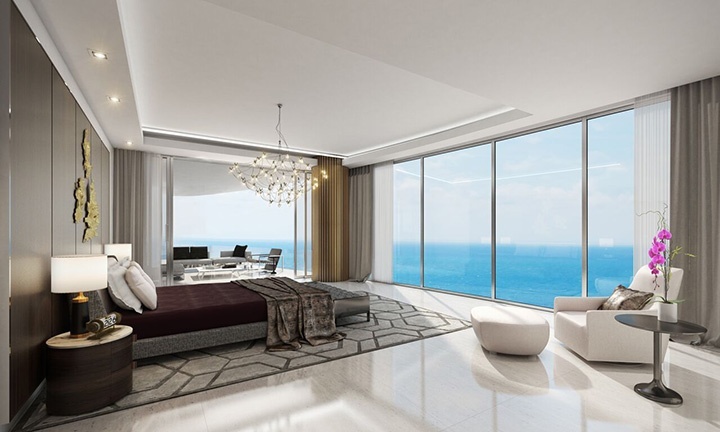 Reservations, sales and construction are now underway on this one-of-a-kind twin tower luxury oceanfront condominium and penthouse home property. 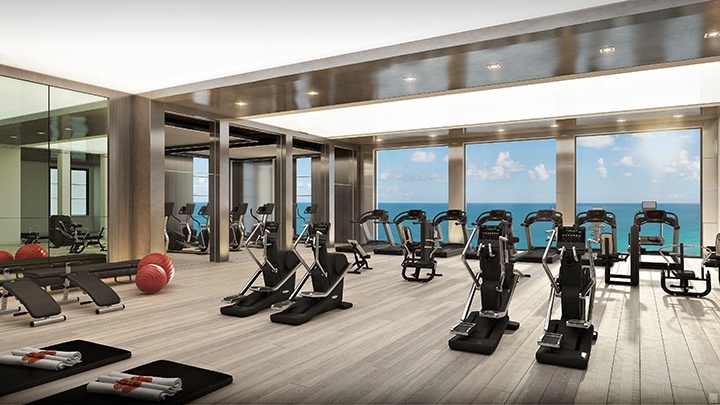 An Aventura affiliate of The Trump Group, led by brothers Eddie and Jules, have begun the 3rd Acqualina branded luxury property in Sunny Isles Beach. 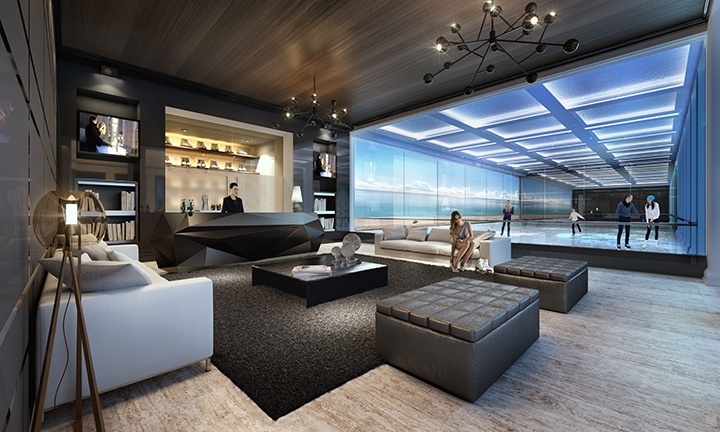 This exclusive luxury condominium development, directly on the ocean in Sunny Isles Beach. 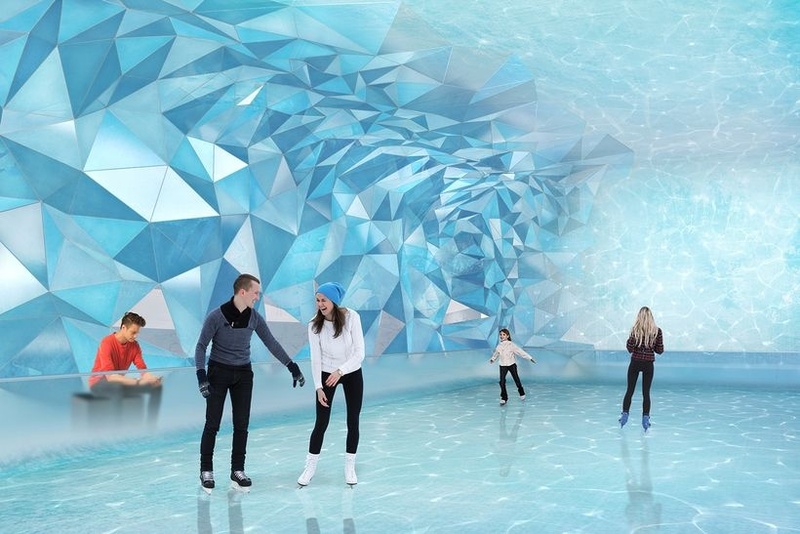 This new luxury development will also bear the luxury brand name of Acqualina. The Trump Group is now underway in the development of their newest 5-star luxury oceanfront luxury condominium development - The Estates at Acqualina Sunny Isles, Miami Beach towers. 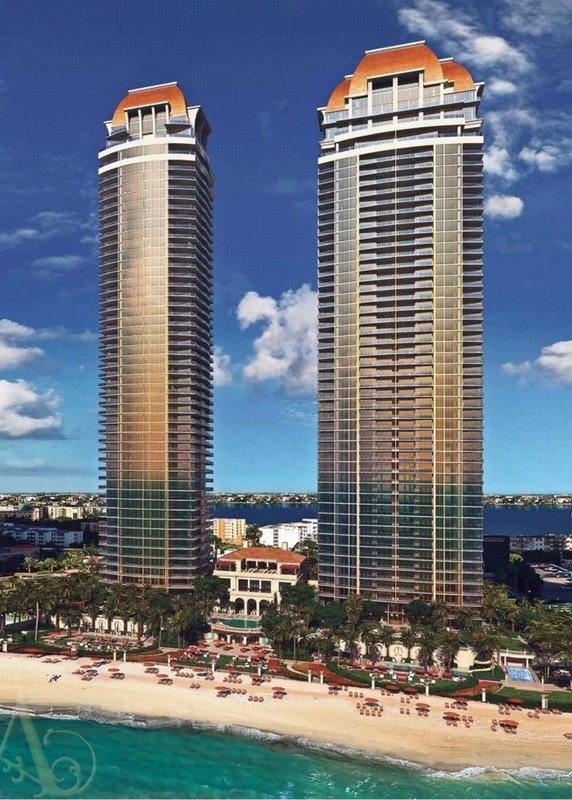 The Estates at Acqualina towers will feature twin 50-story luxury condominium towers offering a total of 247 luxury condominium and penthouse homes combined in the two towers. 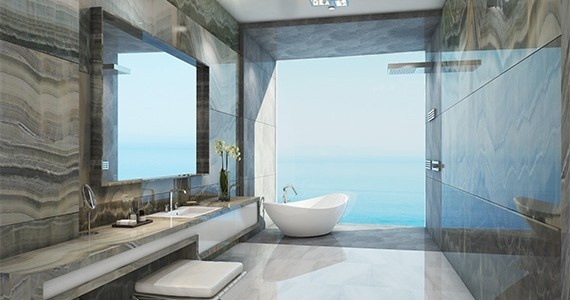 The currently under construction South Tower ( 777 Via Acqualina ) offers 154 3 to 5-bedroom floorplans ranging in sizes from 2,910 to over 9,000 square feet under air. The South Tower offers no more than 4 residences per floor with many floors offering only 2 expansive residences per floor. Select full floor penthouse homes are also available. 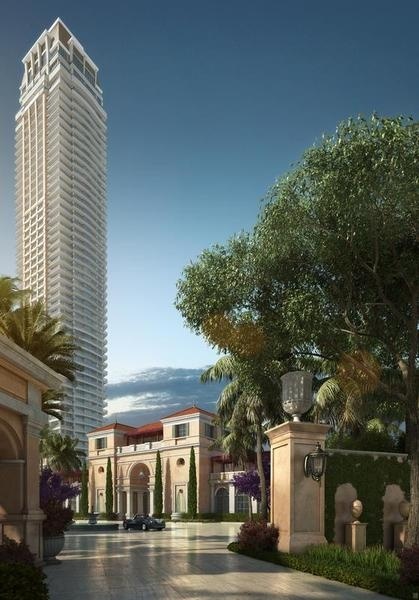 The 2nd-phase (scheduled to begin construction soon) - Estates at Acqualina North Tower ( 888 Via Acqualina ) will offer only 93 spacious 4-bedroom to 6-bedroom luxury residences with most floors offering no more than two Estates at Acqualina residences per floor. 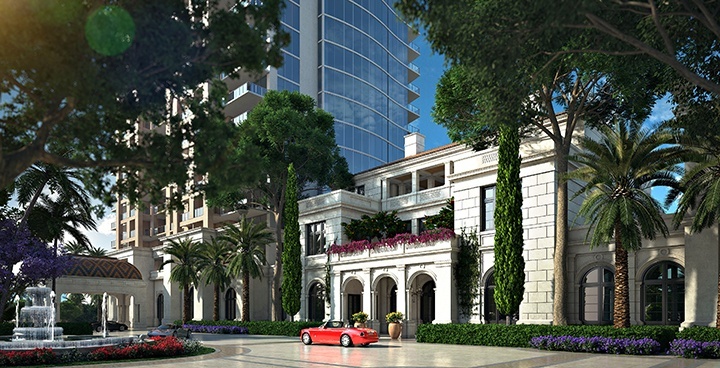 Select full floor penthouse homes are also available at The Estates at Acqualina 888 Via Acqualina condominium tower. The Estates at Acqualina floor plans are all very spacious and "flow-thru" in their designs with oceanfront and western bay views (sunset views) from each of twin towers residences. The large terraces with each residence increases the outdoor living and entertaining space. 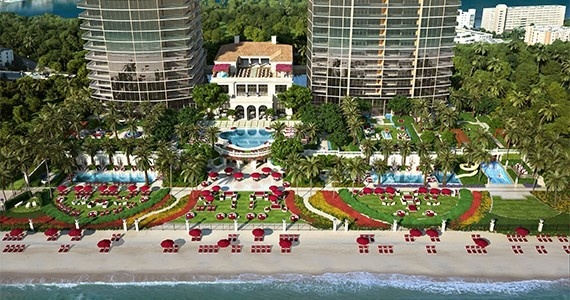 The Estates at Acqualina is being developed on the large 5.6 acre beachfront site of the former Golden Strand Ocean Villa Resort condo-hotel. Photo above shows the oceanfront location of this new luxury condominium development highlighted in yellow. The South Tower and all amenities and entertainment facilities, including the 45,000 square foot Villa Acqualina will be constructed at the same time to ensure that all the first residents at this luxury oceanfront property can enjoy the full list of features, amenities and services from the first day - Restaurants, bowling, ice skating, movie theater, just to name a few of the offerings. 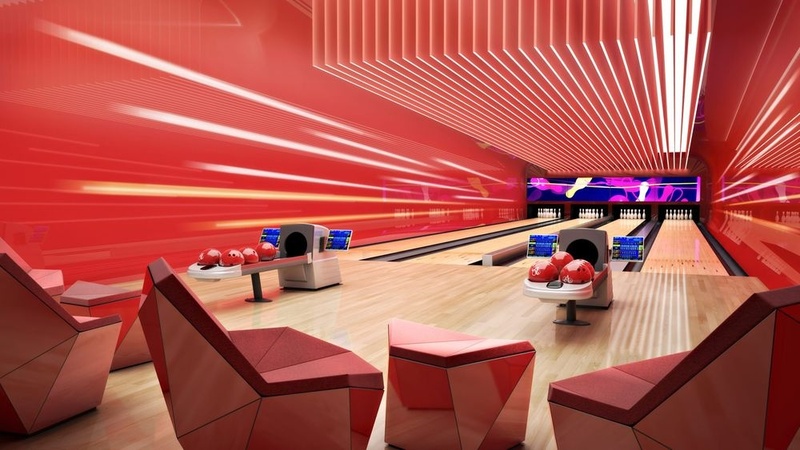 Grounds to include 8 infinity-edge pools surrounded by lush landscaping and private garden areas with FlowRider surf simulator, basketball and soccer areas, pet walking area and much more. Villa Acqualina - A 3-story Mediterranean styled villa complex located between both towers will feature over 45,000 square feet of amenities, including restaurants, lounge, gym, spa, bowling lanes, ice skating rink, billiard room, virtual golf and racing rooms, rooftop pool and much more... View more Villa Acqualina details in our Amenities tab above. The Acqualina luxury condo history - The Trump Group first developed the 51-story, 285-unit Acqualina Ocean Residences & Resort condo tower at 17885 Collins Avenue in 2006. 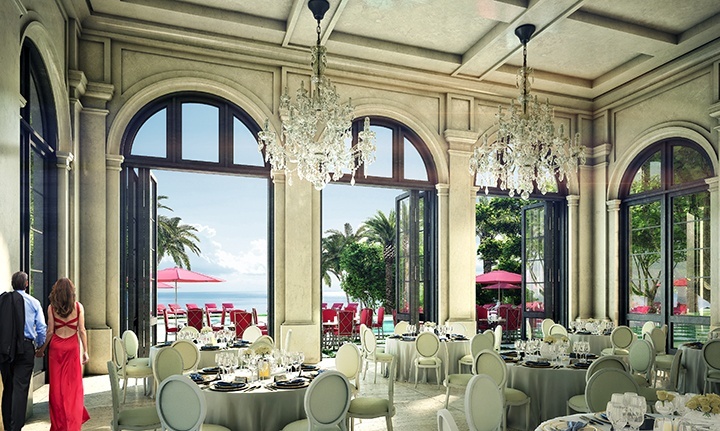 This original Acqualina Resort & Residences features 188 luxury condo residences and 97 resort suites and rooms, and is located immediately south of the location where the newly proposed Estates at Acqualina towers will be built. 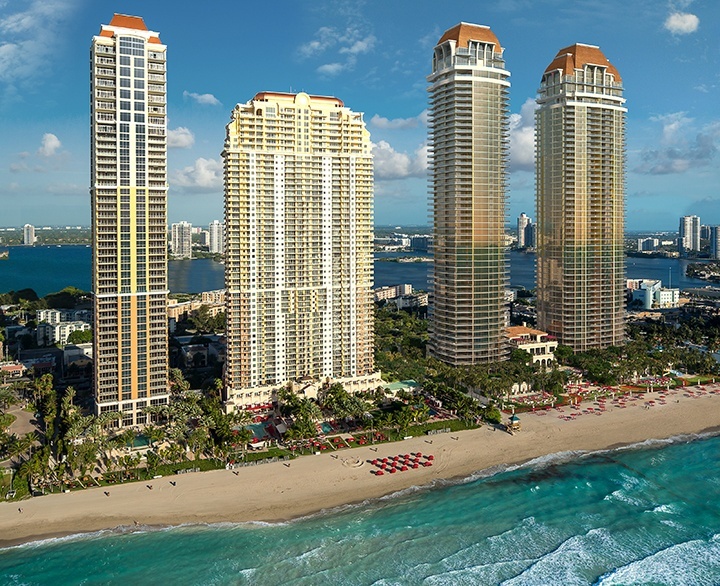 A second Trump Group ultra luxury condominium development – the 47-story, 79-unit Mansions at Acqualina condo tower at 17749 Collins Avenue opened at the end of 2015, just two lots south of the future Estates at Acqualina site. The Trump Group – had developed most of the well known Williams Island luxury condos on the Intracoastal Waterway in Aventura – before focusing their attention on luxury oceanfront developments. Their developments have always raised the bar in elegance and luxury living with each subsequent development. The developer has released just a few of the Estates at Acqualina luxury condos for sale onto the public MLS (those residences are shown below - If no residences are shown, please contact Linda "G" directly for up-to-date non listed residences available), Many more residences are available, please contact me directly for the complete list of available residences for sale. 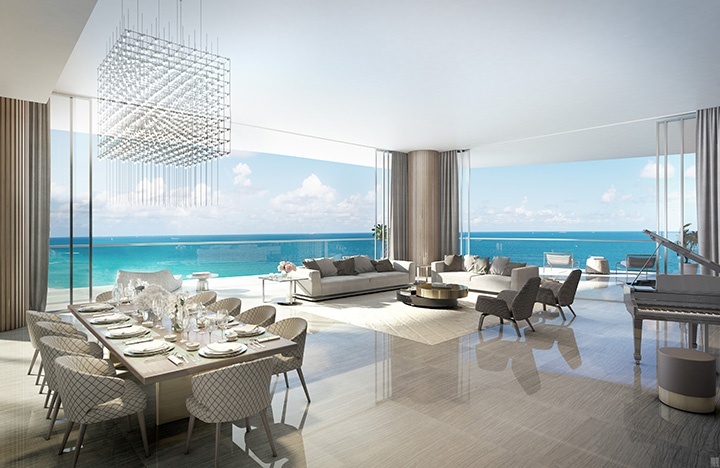 I will be happy to introduce you to this one-of-a-kind $1.5 billion luxury property and give you a tour of the property and all the additional award-winning 5-star services provided to future resident's by the next door Acqualina Resort. Click on any small floor plan image to view it as a larger image. Not all Estates at Acqualina floor plans are currently available on this page. Contact Linda "G" directly with any questions. Currently the South Tower 2 per floor residence floor plans are posted below. The North Tower with the smaller 3 and 4-bedroom floor plans are pending. Contact Linda "G" directly for that up-to-date information. Additional single-family home, suite and 2-story penthouse floorplans are available upon request - contact Linda "G" directly for more information. 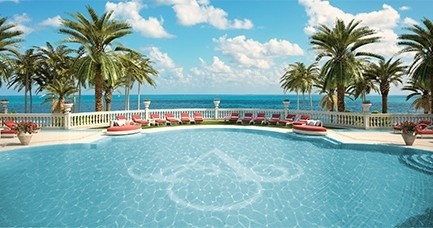 Contact me directly to be placed on my VIP list for up-to-date information on The Estates at Acqualina luxury condos. ORAL REPRESENTATIONS CANNOT BE RELIED UPON AS CORRECTLY STATING THE REPRESENTATIONS OF THE DEVELOPER. FOR CORRECT REPRESENTATIONS, REFERENCE SHOULD BE MADE TO THE DOCUMENTS REQUIRED BY SECTION 718.503, FLORIDA STATUTES, TO BE FURNISHED BY A DEVELOPER TO A BUYER OR LESSEE. THIS OFFERING IS MADE ONLY BY THE PROSPECTUS FOR THE CONDOMINIUM AND NO STATEMENT SHOULD BE RELIED UPON IF NOT MADE IN THE PROSPECTUS. THIS IS NOT AN OFFER TO SELL, OR SOLICITATION OF OFFERS TO BUY, THE CONDOMINIUM UNITS IN STATES WHERE SUCH OFFER OR SOLICITATION CANNOT BE MADE. PRICES, PLANS AND SPECIFICATIONS ARE SUBJECT TO CHANGE WITHOUT NOTICE. *NOTE: THE FEATURES DESCRIBED ABOVE ARE PROPOSED ONLY, THE DEVELOPER RESERVES THE RIGHT TO MODIFY OR REVISE ANY OR ALL OF THE SAME IN ITS SOLE DISCRETION AND WITHOUT PRIOR NOTICE. WITHOUT LIMITING THE GENERALITY OF THE FOREGOING, THE DEVELOPER RESERVES THE RIGHT TO SUBSTITUTE ANY OF THE FOREGOING WITH ITEMS OF SIMILAR OR BETTER UTILITY, IN DEVELOPER'S OPINION. ALL MILLWORK PANELING, AND DESIGNER LIGHTING FIXTUES ARE DESIGNER UPGRADES AND ARE NOT STANDARD. 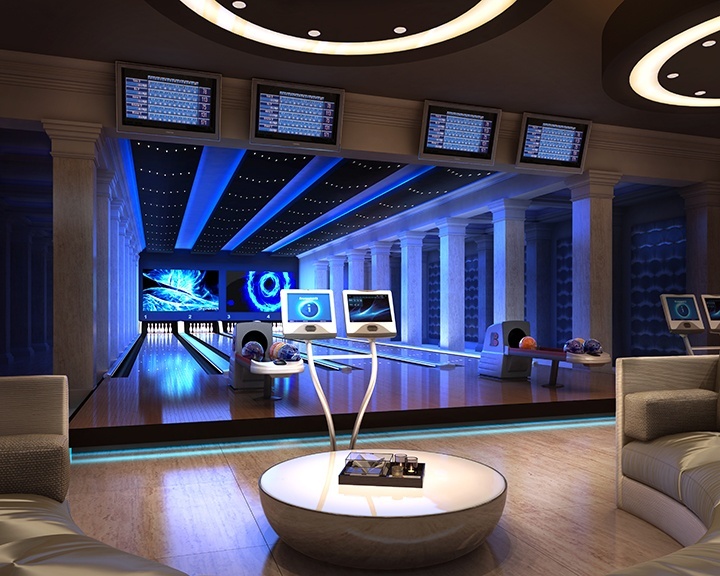 CERTAIN ITEMS, IF INCLUDED WITH THE RESIDENCE, SUCH AS MARBLE, STONE, GRANITE, TILE, WOOD AND OTHER NATURAL MATERIALS ARE UNLIKELY, BECAUSE OF THE CHARACTERISTICS OF THE PRODUCTS, TO BE DUPLICATED AS SHOWN IN ANY MODEL RESIDENCE. PURCHASER SHOULD EXPECT SIZE, COLOR, GRAIN AND QUALITY VARIATIONS, INCLUDING, WITHOUT LIMITATION, CHANGES AND VARIANCES IN THE SIZE OF SLABS, TILE AND/ OR OTHER MATERIALS UTILIZED IN THE RESIDENCE. THIS OFFERING IS MADE ONLY BY THE PROSPECTUS FOR THE CONDOMINIUM AND NO STATEMENT SHOULD BE RELIED UPON IF NOT MADE IN THE PROSPECTUS. THIS IS NOT AN OFFER TO SELL, OR SOLICITATION OF OFFERS TO BUY, THE CONDOMINIUM UNITS IN STATES WHERE SUCH OFFER OR SOLICITATION CANNOT BE MADE. PRICES, PLANS AND SPECIFICATIONS ARE SUBJECT TO CHANGE WITHOUT NOTICE. One of the many outstanding features of The Estates at Acqualina is that each luxury residence will be delivered in furniture ready condition, thus saving you not only cost and aggravation, but also the (up to) one year that it usually takes to finish such a residence. Each owner will be given the opportunity to work with a renowned interior design firm to select from tastefully composed palettes offering an uncompromising attention to detail and style. 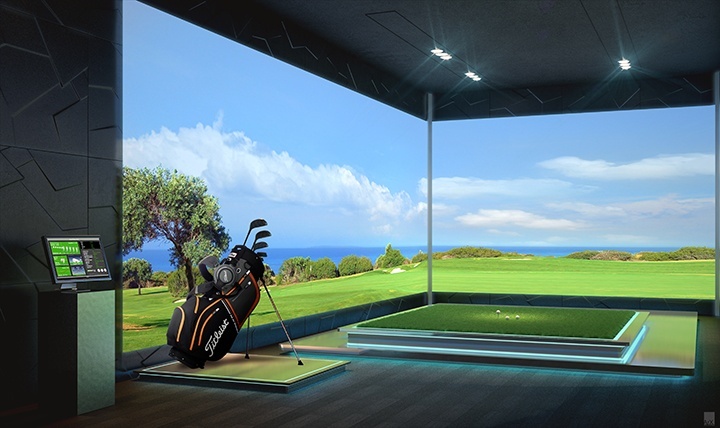 Each residence at The Estates at Acqualina will be designed to these exacting standards. The palettes will have an impressive selection of complementary and carefully balanced marble, sourced from some of the finest quarries in the world. 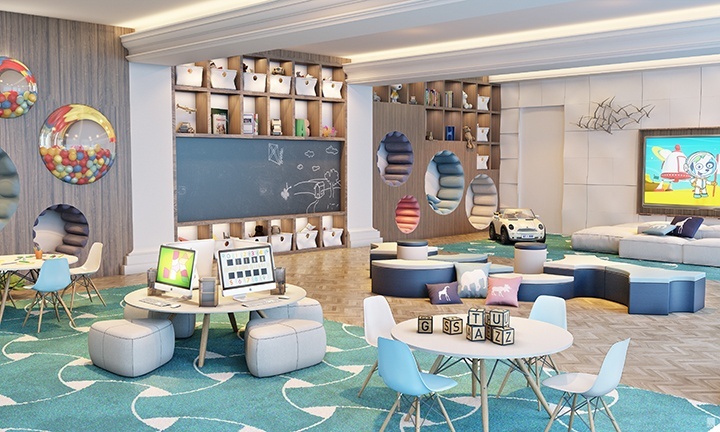 Each palette produces the perfect foundation on which residents can imprint their own interior design personality thus calling their residence - HOME.